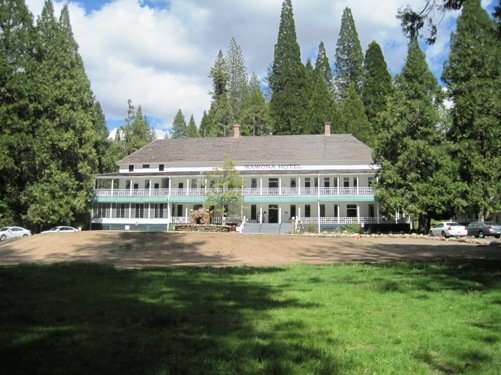 Located four miles from the south entrance into Yosemite National Park, the Wawona Hotel sits between the magnificent Mariposa Grove of Giant Sequoias and the lively Yosemite Valley. In 1855, a miner by the name of Galen Clark was in failing health when he passed through the Wawona Valley with a group of tourists on their way to the Yosemite Valley. He was immediately entranced by the area, and in 1856 returned to build a 12-by-16 foot log cabin near a spring on the west end of the meadow, where he expected to live out his remaining time on earth. Clearly a smart man, Clark built his abode along the main trail leading into the Valley, making it inevitable that travelers would stop both on their way to the Valley, and on their way back. And when they stopped on their way back, they would be out of provisions. According to Clark, he always had a healthy supply of fresh venison and trout, which he would provide to passing visitors. 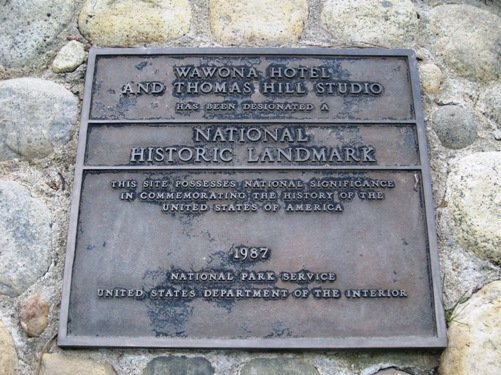 This led to Clarks Station, which was later called Big Tree Station – the predecessor of the Wawona Hotel. In 1878, a kitchen fire destroyed all of the old buildings at Clarks Station and the entire establishment was rebuilt and opened the following year. The only buildings to survive the fire of 1878 were the stable and Long White (now named Clark Cottage in honor of Galen Clark), which was opened in 1876. …Within a week of the fire, they hired Joseph Shelly, builder of the Long White, and staked out a large two-story building that would include a lobby, sitting room, dining room, office and 25 guest rooms. Although accounts vary, it is believed the new hotel was ready and open for business in the summer of 1879. 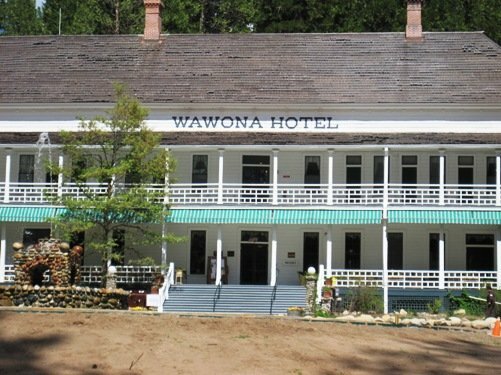 Today’s Wawona Hotel is National Historic Landmark and a perfect place to stay for those who prefer a more relaxed environment. Explore the property’s lush meadows and tranquil streams, play a round of golf at the Audubon Certified Sanctuary, do a little cross-country skiing or snowshoeing, or simply take in the sights while enjoying a cocktail. 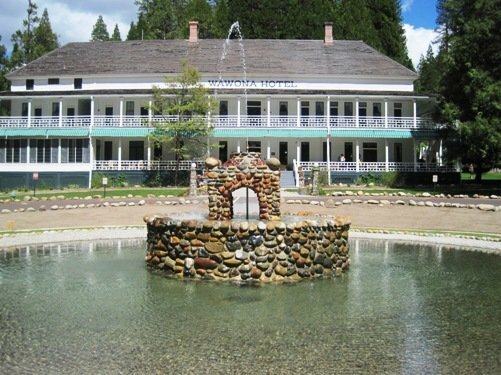 The Wawona Hotel offers 104 guest rooms, including 54 with access to shared bathrooms; rooms without a private bath are often compared to European-style hotel rooms, with conveniently located restrooms and shower facilities in each building. Rooms are furnished with a mix of reproduced and authentic period furniture, marble-topped dressers, overstuffed chairs, and upscale country décor. In March 2002 a $400,000 guest-room renovation was completed, during which 48 rooms received new window treatments, wall coverings, furniture, carpeting, lighting, bedding, and bathroom fixtures. This entry was posted on Monday, June 6th, 2011 at 11:09 AM	and is filed under Nearby Attractions. Both comments and pings are currently closed.